Superman IV: The Quest for Peace (1987): The critics give this movie so much crap, and I can't believe it! I think it's probably the best of the Superman movies. It's definitely the shortest at about an hour and a half. The others were over 2 hours, almost 3 hours, long. This film moves quickly and has an action-filled plot. Lex Luthor returns, this time with hip nephew Lenny Luthor. We finally see a romance budding between Superman and Lois Lane. Lois has a rival for Clark's affections. The Daily Planet is being taken out of editor Perry White's control, which provides an interesting subplot. 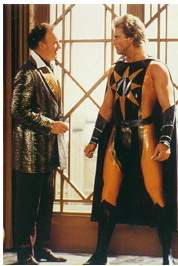 Lex Luthor clones Superman to make a solar-powered villain called Nuclear Man. Nuclear Man nearly kills Superman, making him sick. Superman regains his strength through a magic crystal given to him by his long-dead biological parents. This movie is more than just a street brawl between Superman and a powerful villain. He does all sorts of amazing feats of strength. Plus, it's a statement against the use of nuclear arms. This movie was made in the final throes of the Cold War, so it was a lot more relevant then. Plus, I've read in various interviews that this was Christopher (Superman) Reeve's favorite Superman film. If you haven't yet seen this film, give it a chance. I'm sure you'll like it!